A cream soup is so much easier to make than a clear soup. But clear soups are more warming during the cold season, and they’re also more versatile than the cream ones. Find out the basics about them and don’t be afraid to use them when making other dishes too! Oh, what could be better these cold days than having a big bowl of hot soup anytime your legs and hands are freezing? Soups are a blessing during the fall and winter seasons, so you should cook them often. When it comes to myself, I prefer clear soups, because they are lighter than cream soups and I can serve them really, really hot. I like to feel my cheeks burning after a few sips of hot clear soup. I also sometimes take small bites of hot peppers, to increase the hotness. And, yes, then I forget about the coldness and I’m ready to face the cold outside. We have many cream soup recipes, and some of them are made with fall foods like pumpkin, butternut squash, or mushrooms. But we don’t want to ignore the benefits and sheer pleasure of eating clear soups. Lightly seasoned clear soups are used as an appetizer, the first dish of the meal, who acts as a stimulant and comfort food throughout the world. Clear soups can be made with meat, fish and vegetable stock. They are used for making meatball soup, minestrone, pasta soup, beef soup, but can also be served on their own. Here are some basic clear soups. 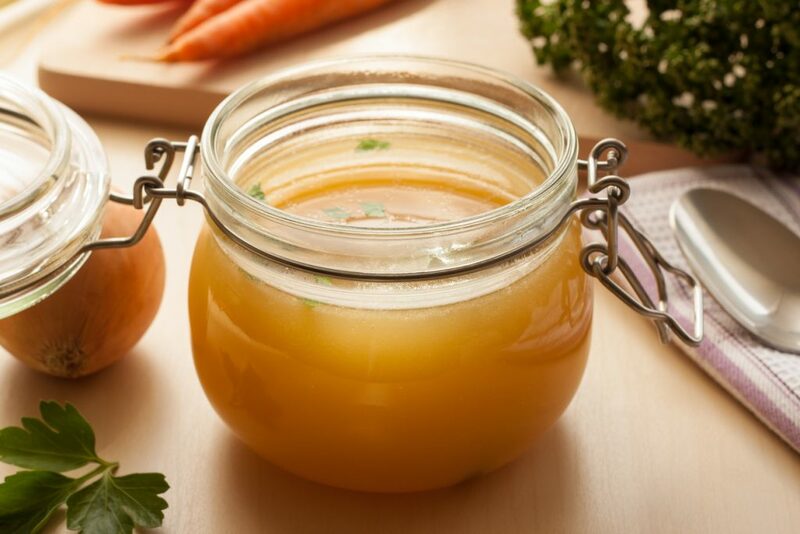 Bone broth can be stored in glass jars or even frozen for later use. A consommé (French term) is a type of clear soup made from richly flavored stock that has been clarified, a process which uses egg whites to remove fat and sediment. It’s made from fish, meat, poultry or vegetable stock. Consommé can be served by itself, as an appetizer or used in other recipes. This is not a very easy-to-make soup but requires advanced cooking skills. It’s considered a high-quality soup. Beef consommé is the main ingredient in French onion soup. A consommé is made by adding a mixture of ground meats, together with carrots, celery, onion, tomatoes, and egg whites into stock. The key to making a high-quality consommé is simmering and frequent stirring, both actions bringing the impurities to the surface of the liquid, which is further drawn out due to the presence of acid from the tomatoes. Eventually, the solids begin to congeal at the surface of the liquid, forming a ‘raft’, which is caused by the proteins in the egg whites. Once the ‘raft’ begins to form, the heat is reduced, and the consommé is simmered at a lower heat until it reaches the desired flavor, which usually takes anywhere from 45 minutes to over an hour. A consommé can be served by itself, as an appetizer or used in other recipes. Julienne soup has a delicate flavor and it can also be called ‘shredded vegetable soup’. Its name comes from the French name “julienne”, which is a particular way of cutting the vegetables (stick-shaped and very thin). Julienne soup is usually made with turnips, carrots, onions, leeks, celery and meatballs or poultry. The vegetables are lightly fried or browned in butter but must not be overly greasy. The soup uses either a consommé or a vegetable stock. Many of the soups during the 18th century involved putting the cooked vegetables and meat through a sieve, leaving a clear broth. Vegetables, such as carrots and turnips, were to be cut ‘riband-like,’ while celery, leeks, and onions were cut in small even slices or ‘lozenges’ shape. Noodle soup refers to a variety of soups with noodles and other ingredients served in a light broth. This type of clear soup is a common dish across East and Southeast Asia. Various types of noodles are used, such as rice noodles, wheat noodles, and egg noodles. The soup is based on a soy, fish, meat, poultry or vegetable broth and contains, besides noodles, spices and vegetables local to the region. Common noodle soups are wonton soup from China, udon soup from Japan, served with a thick noodle, vegetables, and egg in a spicy soy broth, and ramen which uses a thin noodle in a pork or chicken broth, flavored with miso, seaweed, and bamboo shoots. 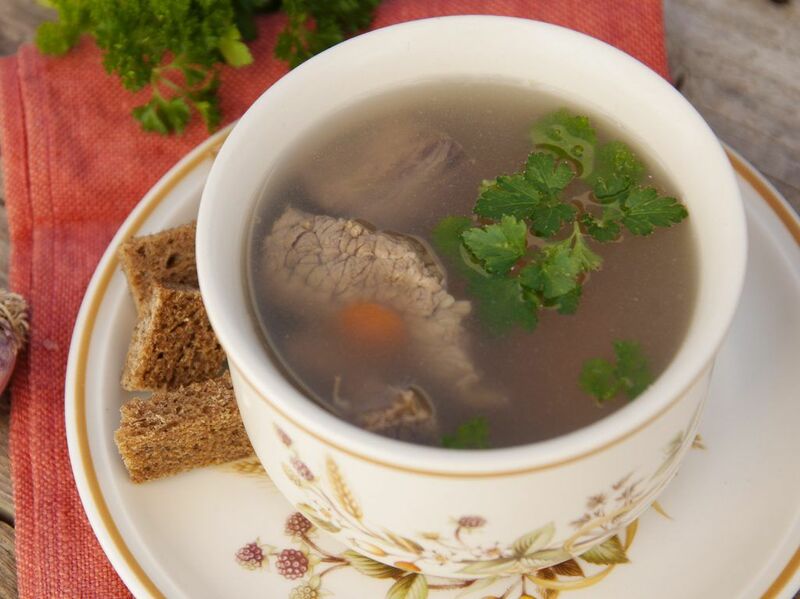 Broth is a liquid in which you’ve cooked meat. It can contain bones but not necessarily. It’s made by simmering meat, mirepoix (which is a sautéed mixture of diced vegetables such as carrots, celery, and onions), and aromatics in water for a relatively short amount of time, usually under two hours. Unlike stock, broth is typically seasoned. Broth can also be made by cooking fish, grains or vegetables. 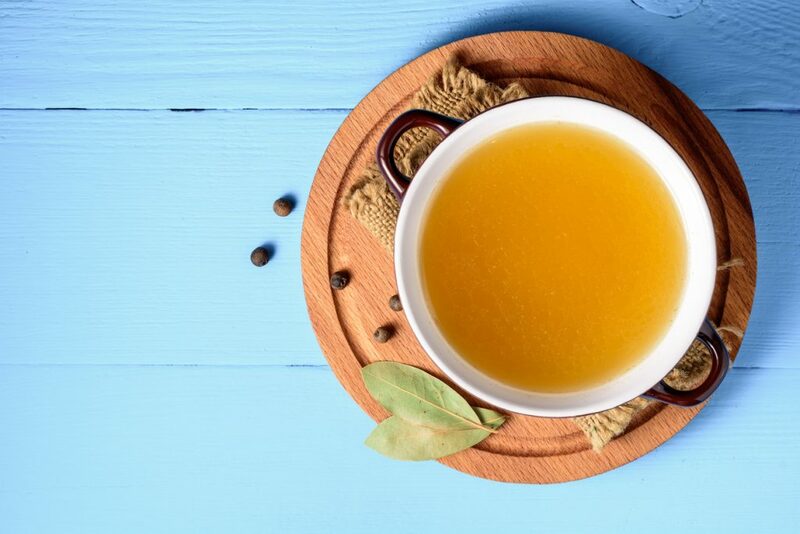 Broth can be eaten alone or flavored with light vegetables and spices or used as an ingredient in stews, pasta dishes, and heavier soups. You can use it (as well as stock) to make egg drop soup, noodle soup, miso soup, and basically any type of soup.